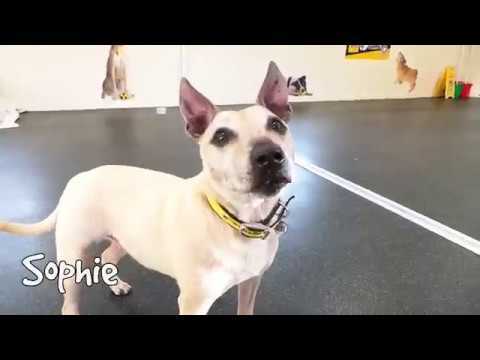 Sophie is a senior Staffie Cross with a loveable character. Her favourite things to do are: finding toys & carrying them to her bed to build up her collection, munching on a tasty bonio, short walkies in quiet areas or snuggling up next to her favourite people. Sophie would love to find a multi-person household, so that there is always someone around to keep her company. Her dream home would be somewhere quiet & peaceful, without too much going on around her & she'd like a garden of her own to relax in. She could live with teenagers over the age of 16 and visitors to her home will need to be of the same age. Much more a fan of her human company, she is looking for a home as the only pet and would like to be walked in areas away from lots of other dogs. Sophie is a gorgeous older girly who is hoping to find a loving family who could make her feel right at home. Having her around the house and just watching her enjoy each day as it comes will be a truly rewarding experience. Thank you for your interest in Sophie, who is based at Shoreham. Please note this is not a reservation on this dog. To start the rehoming process you will need to go to a rehoming centre for a quick chat. Please find information below about what to expect during the rehoming process. We hope to see you soon.